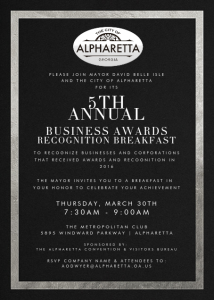 On March 30th 2017, the City of Alpharetta presented Georgia Urology with the 2016 Business of Excellence Award during their 5th Annual Business Awards Recognition Breakfast. This event is designed to celebrate the companies that go above and beyond within the community, in particular, those who have received other awards or special distinctions in the past year. In addition to celebrating award-winning local organizations like Georgia Urology, the event presented an opportunity for the 220 businesses being honored to come together and learn from one another’s accomplishments. Local figures such as Alpharetta Economic Development Director Peter Tokar, Alpharetta City Councilman Chris Owens, and Alpharetta Mayor David Belle Isle were in attendance.